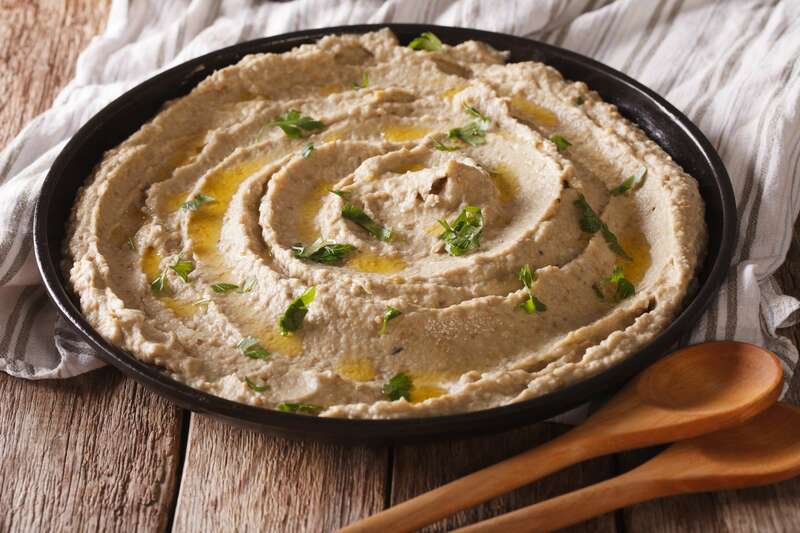 Baba ganoush is a classic Middle Eastern dish made from roasted eggplant, garlic, tahini, aromatic spices and a little olive oil. Puree the mixture into a delicious creamy dip that you can use as an appetizer with warm pitas or crunchy crudité. RecipeSavants.com Baba ganoush is a classic Middle Eastern dish made from roasted eggplant, garlic, tahini, aromatic spices and a little olive oil. 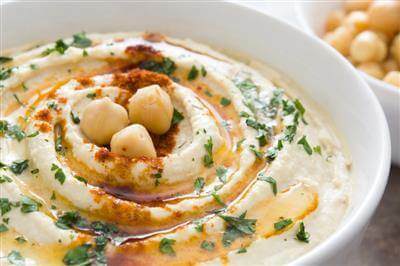 Puree the mixture into a delicious creamy dip that you can use as an appetizer with warm pitas or crunchy crudité. Smart Recipes, Middle Eastern Recipes, Vegetables Recipes, Recipes Vegetables Middle Eastern Baba Ganoush PT1H Serves 6 Ingredients: 3 Medium Italian Eggplants 3 Cloves Garlic 1 Small Lemon 3 Tablespoons Tahini 0.66 Cups Extra-Virgin Olive Oil 1 Teaspoon Salt 1 Small Bunch Fresh Parsley Preheat a grill pan to medium-high and grill the eggplant for 35-40 minutes, turning occasionally until charred on all sides. Wrap the eggplant in aluminum foil, and rest for at least 15 minutes. Scoop the flesh out of each roasted eggplant, and transfer to a large salad spinner until the eggplant is dry. Combine the eggplant, garlic & lemon juice in the bowl of food processer and pulse until mixture is a thick paste is formed. Slowly pour in the tahini, and a 1/3 cup of olive oil, and continue to pulse until well combined. Season with the salt and parsley, and pulse again until just combined. Garnish with remaning olive oil. 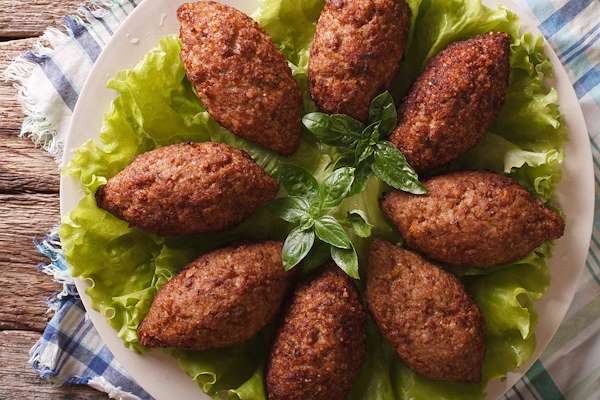 If you enjoyed this easy Middle Eastern recipe, you'll love these fresh ideas! Bring a taste of the Middle East to your table with this easy meatball dish. Combine ground beef with parsley, cumin, coriander, and other spices for a tasty mix. Then shape the mixture into balls and bake before serving with tahini sauce. This incredibly simple and refreshing salad is perfect for simple summer suppers. 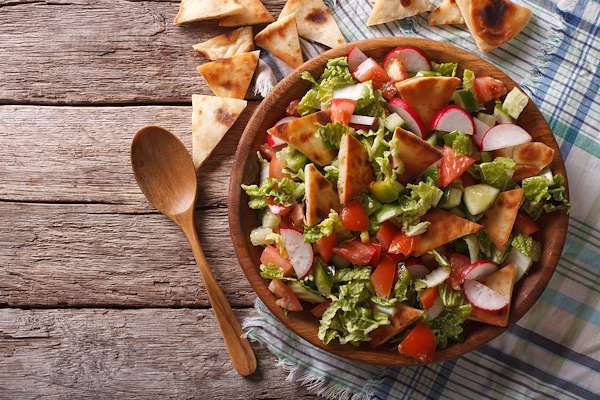 The colorful combination of tomato, radishes, red pepper, cucumber and romaine lettuce pair perfectly with the tasty Middle- Eastern Salad Dressing. Middle Eastern people have enjoyed hummus for ages. The recipe is easy and loaded with flavor from the garbanzo beans, tahini, garlic and other zesty spices. Hummus is a healthy treat that pairs well with pita chips or fresh veggies. Some of the simplest salad recipes, like this Israeli-inspired one, can be the most elegant. It marries the sweetness of carrots and raisins with savory garlic and tart pomegranate seeds. Toss in the delightful citrus vinaigrette and serve.